InSites Consulting’s Joeri Van den Bergh will be taking to the stage at YMS17 to talk help our audience understand why Millennials are different in the workplace, and how companies can adapt their strategies to become more Millennial proof. Here he shares the next iNextGen (Gen Y & Z) DNA characteristics series ‘Dreaming of a better world’ as this young generation is dreaming of creating a better society, a better planet. Let’s be honest: in today’s rapidly changing polarized political climate, we do hope that a new young generation of leaders will soon step up to decide which direction the world is heading in, before it’s too late. One of the questions we asked in our global cross-generational study was: Are you in favor of gender equality? When looking into the details, we notice it’s actually Gen Z, the youngest, aged 6 to 20, who are most in favor of gender equality. Today’s kids and teens are growing up in a society where blurring of genders is the new normal, even at a very young age. Think of Brad Pitt and Angelina Jolie’s first biological daughter, Shiloh. Her parents have decided to call her John because Shiloh has been feeling more like a boy than a girl since the early age of 3. Miley Cyrus is another good example of a popular Gen Z celebrity who disagrees with the binary predefinition of genders. She openly declares she doesn’t feel like either girl or boy. To her it’s a fluid mental state that can change every day. Miley actively endorses LGBT rights with her Happy Hippie Foundation. If you look at fashion, one of the trends in the past years has been a type of jeans called the boyfriend jeans, which are male jeans worn by women, as a way to express their identity. Then hipster boys suddenly started imitating the way girls were wearing boyfriend jeans (with rolled-up legs). So boys started imitating girls who were imitating boys, if you are still with me. It’s quite confusing, but in the end to me it was the ultimate proof of gender blurring in fashion. And indeed many fashion brands, especially luxury brands like Gucci, Prada, Givenchy and Saint Laurent, have gender-neutral collections today. Selfridges launched a 3-storey pop-up store where they sell 40 different brands with mixed clothes collections for males and females. There is no male-only or female-only section or floor in the shop. The classic Disney fairytale narrative with typical role patterns (a girl cleaning the house or preparing meals for little people until a prince comes along on a white horse, they kiss and marry…) has been adapted completely to concurrent Gen Z desires. In 2009, Disney made The Princess and The Frog, with Tiana as a female lead character. In 2010 there was Rapunzel, again a female lead character. In 2013, the most successful Disney franchise and movie ever, Frozen, was launched, with 2 sisters Anna and Elsa, a story about sisterhood and female bonding. There was also Brave with Merida and there will be a Frozen II of course. So it’s clear that Disney understands that in today’s society, female empowerment and strong female characters are the new way of connecting with the youngest generation. Mattel launched a new line of dolls using the theme of Super Hero Girls, together with DC Comics and Warner Brothers. And AdAge recently reported on how the toy industry is breaking gender barriers even with a transgender Jazz doll based on the popular TLC show of the 16-year-old transgender Jazz Jennings. So how do we translate this to other industries? It’s clear we should all consider using female empowerment in our branding and communication campaigns. 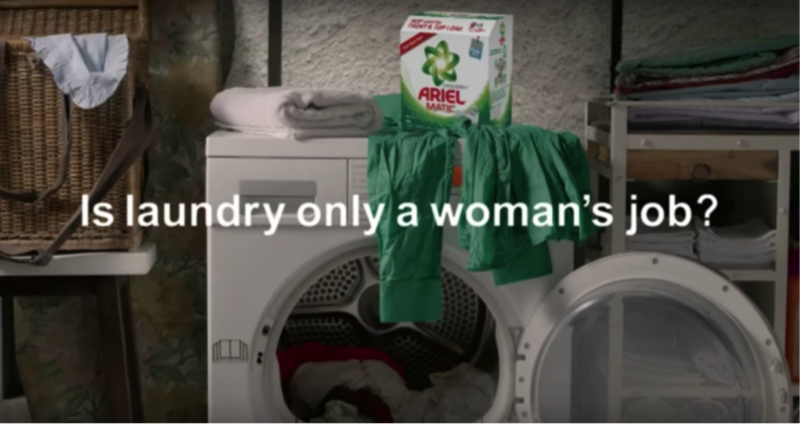 Procter & Gamble is already doing so in their #likeagirl campaign. They started this campaign in 2014 and it was one of the best evaluated spots during that year’s Super Bowl, as well as one of the most trending Twitter topics back then. It got more than 100 million views. Its approach was of course largely inspired by what Unilever has been doing for over a decade of campaigning for real beauty with Dove. And we all know that Dove became Unilever’s first 5-billion-dollar brand. Let’s say P&G discovered that this is the right way to connect with the youngest generation. They are even applying this core message to other brands across their markets. Take a look at Pantene’s #shinestronger campaign in the UK for instance or the Ariel #sharetheload commercial in India. In the meantime, Unilever has also replaced the traditional babe magnet positioning of its 30-year-old Axe/Lynx male cosmetic brand with a campaign that encourages men to find their own magic. The Find Your Magic film has been viewed more than 10 million times on YouTube and since the campaign’s launch, the brand has seen its global sales growth triple. Supporting LGBT rights is one step further. Handmade cosmetics brand Lush is helping to raise awareness with its Love Fund. In July 2015, the brand launched their #GayIsOk campaign together with All Out to raise awareness for the fact that in 76 countries around the world being gay is a crime. Together, they asked customers all over the world to take part in the biggest conversation ever to be held on social media, using #GayIsOk and invented the sparkling and beautiful Love Soap, with the entire sum of each bar purchased going to the Love Fund. Direct campaign messages about #GayIsOk had a social reach of 30 million. After the US Supreme Court ruled on marriage equality, the hashtag #GayIsOK reached a further 40 million. Next to that, 107,479 sparkly gold bars of Love Soap were sold, creating a Love Fund of £275,955. This Love Fund will now be donated in grants of £100 to £10,000 to grassroots groups, collectives, charities, communities and activists working on equality laws, acceptance and inclusion for LGBT individuals. Or Diageo’s We’re Open positioning for its Smirnoff vodka brand. While sticking to the nightlife (music & dancing) DNA of Smirnoff, the brand successfully translated this core idea in an inclusive brand platform with several campaigns: deaf dancers, albino African deejays etc. What are the main issues that the next generation is concerned about? Take a look at the results of our cross-generational study. The top 2 concerns are terrorism and the economic crisis. The latter is less of a concern to Gen Z than to other generations as most of them are not confronted with employment issues yet. But Gen Z does really stand out when it comes to health issues, racism and underdevelopment in Third World countries. Just think of Boyan Slat, a 17-year-old Dutch guy who, on one of his holidays, came up with an idea to clean up the ocean, by means of 2 giant arms that collect the plastic waste using the ocean tide. He got an interview with John Kerry and, by 2020, 40% of the world’s oceans will be cleaned thanks to this GenZer. This is just an example of how this young generation is concerned about the planet. We see some brands connecting with youth in this ’we help you create a better world’ theme. For instance, G-Star Raw, a denim brand, created a pair of jeans made from recycled ocean plastic. They are using Pharrell, also a known advocate for this good cause, to promote the collection. Adidas released a limited edition of 7,000 pairs of cool sneakers made from recycled plastic fishing nets (picture). They sold out in a snap. Earlier this month, H&M’s Conscious Exclusive Collections launched the Bionic Yarn, a fabric made from recovered plastic from waterways and shorelines. The company made a clear statement by not choosing a basic t-shirt or skirt, but opted for a ravishing evening gown to show the potential of upcycling. And this is not just a one-off. In an interview with Vogue, Ann-Sofie Johansson, H&M’s Head of Design, declared that their Conscious Exclusive Collections are a great example of how they can try out new, innovative materials and later on scale them in their normal collections. Sister brand &Other Stories is known for its emphasis on recycling clothes and packaging offering clients a standard 10% discount when they return used items. In the IT industry even, Dell recently announced their Ocean Plastics packaging (100% recycled plastics, 25% from oceans), together with Social Good Advocate, actor and activist Adrian Grenier. They are creating the first commercial-scale global ocean plastics supply chain, processing plastics collected from beaches, waterways and coastal areas and using them globally as part of a new packaging system for the XPS 13 2-in-1 laptop. This initial pilot project will start by recycling 16,000 pounds of plastics from the ocean. When it comes to fair trade and the Third World problems, there is this new ‘141’ business model, ‘buy one and donate one’, which works really well with the youngest generation. Blake Mycoskie, CEO of TOMS Shoes, was one of the pioneering engineers of the model. TOMS have already donated more than 50 million pairs of shoes to poor children based on the guilt-free consumption of NextGen and then copied the concept to coffee and eyewear as well. Mycoskie’s ideas have inspired many other companies and initiatives including Warby Parker, the Munchery meal deliveries and many more. And it all seems very challenging for some of the affected industries, unless you understand how to deal with them and even support them actively. The French retailer Intermarché is even helping its customers to detox from sugar, promoting the Sugar Detox chocolate dessert that has 10% less sugar in every single serving. NextGen is expecting brands and marketers to help them live better and healthier lives with less waste and a more balanced lifestyle. 7 out of 10 Millennials expect brands and companies to help them to do something back for society. This series of 4 articles highlights 4 key DNA aspects of what is called NextGen – a combination of Millennials or Gen Y (currently the young adult generation of 21-36-year-olds) and their successors, Generation Z (aged 6-20 today). To get to this NextGen DNA, InSites Consulting interviewed 10,000 people from 4 different generations: Gen Z, Gen Y, Generation X (aged 37 to 52, the parents of Gen Z) and the Baby Boomers (aged 53 to 70, the parents of Millennials) in 8 different countries across Europe but also in the US and in Australia. The interviews allowed us to identify significant and relevant differences between these generations and to find out more about this next generation of consumers: Gen Y and Gen Z. Last month we shared the first DNA characteristic: The Snappy Generation. Haven't got your tickets for YMS LDN 2017 yet? Head on over to our event page for more information on the biggest youth marketing conference in Europe.